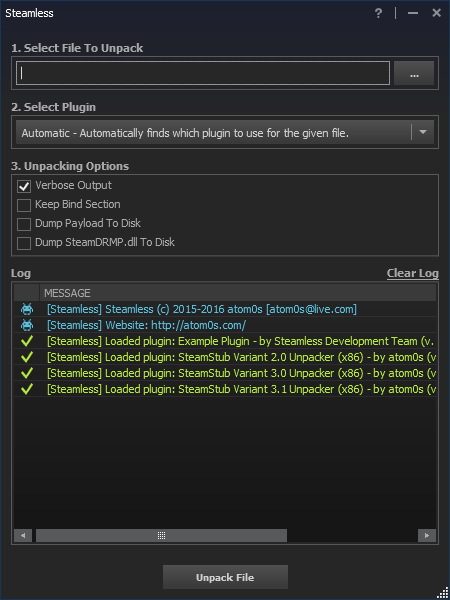 Steamless is a DRM remover for the SteamStub DRM that has been added to most newer games released on Steam. I, atom0s, am not responsible for what you do with this source code. I do not condone piracy and wish that if you choose to remove the DRM of a Steam game, do so with a game that you already own. Use this code at your own risk! I am not releasing a binary form of this project for legal reasons. Instead, the code is posted as an educational piece of work. The code is compiled using Visual Studio 2015. Last edited by atom0s on Sat Feb 13, 2016 7:43 am, edited 3 times in total. I have moved this project to Gitlab as Github has been bought over by corporate greed. Any chance on a compiled build for the latest version? I decided to rewrite Steamless with a UI since I had a lot of emails / private messages from people asking me how to use the old version etc. Along with that, the older version was not extendable or friendly to others developing unpackers. This new version is now fully done via plugins (Example plugin source code is included in the release) allowing others to easily create their own unpackers.